Canvasser Ana Mejia gathers her supplies at the offices of the National Council of La Raza in Miami in 2016. The NCLR renamed itself UnidosUS this month, causing a rift in the U.S. Latino community. Some see it as shedding a dated name, but others see it as leaving a legacy behind. The National Council of La Raza rose out of the Chicano civil rights movement in the late 1960s and '70s. It was a cultural and political movement led by Mexican-Americans, who were advocating for farm workers' rights, political rights and access to higher education. 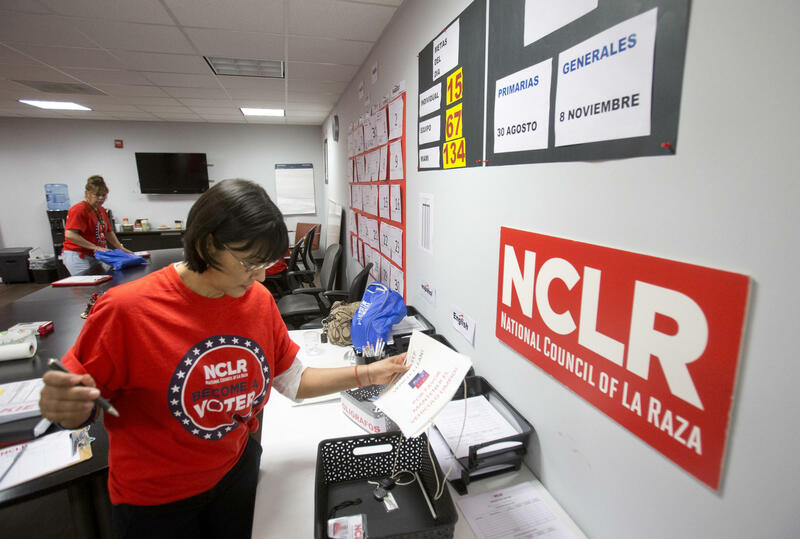 Since then, NCLR has served the Latino community on issues like immigration, health, housing and education. Throughout those years the name has remained controversial. The literal translation of "la raza" is "the race," but a more accurate translation is "the people." Some have come to the defense of the name change. Raul Reyes, an attorney and the former host of the MSNBC Shift show Changing America, wrote an op-ed for NBC, saying it was a smart move. "Now more than ever, this is a time where Latinos need to band together to stand up for our rights," he said. For him, the name La Raza created a distraction from the work the group does. "Many critics of the organization have taken the literal meaning of the word and have tried to twist it to some moniker of racial superiority or saying that Mexicans wanted to take back the Western U.S.," he said. But for some, dropping La Raza felt like the organization was turning its back on its community. For 26-year-old Maricela Monroy of Milwaukee, La Raza has a meaning beyond ethnicity. "La Raza for me when I was growing up was like, the people that are up at 5 a.m. trying to get jobs, the people cleaning the stores, the people picking the food. You know, the working-class folks," Monroy said. Monroy was shocked when she heard news of the name change, especially since political tensions are running so high under the Trump administration. "Right now a lot of the Latino and immigrant community, we clearly feel under attack. So in circumstances like that we would expect Latino groups and immigrant groups to take a firm stance and to go on the offensive. This is the exact opposite of that." Texas professor Aaron Sanchez feels that this name change leaves Chicano history behind. "Part of the name change includes a slight erasure of their connection to the history of the Chicano movement, which is difficult for me because I really think it should be tied to the history," he said. But UnidosUS President and CEO Janet Murguia says the organization is aiming to reach a larger Latino community. Times are changing, and so are the demographics. "We're not the same Latino community that existed from 1968, when we began," said Murguia. The organization conducted research and found that many felt strongly about the mission, but not the words "La Raza." She said Latinos today are younger and more diverse, so dropping the phrase was meant to include more people. Twenty-three-year-old Luz Martinez is an Afro-Puerto Rican woman who was raised in Mississippi. She says "La Raza" didn't connect with her. "The term 'La Raza' is something that not everyone has been able to relate to, particularly people of Caribbean descent like me, or Afro-Latinos — it's not a term that we use." But Martinez also says that with or without the name change, millennials aren't very familiar with the organization in the first place. She says, as far as her friends go, "I'm not sure they would recognize the name before, and I'm not sure they'd be reached with the new name." As part of its re-branding, UnidosUS says it plans to address this challenge by expanding social media and exploring different outreach avenues. For Murguia, this change is about more than just a name. "We want to make sure that people see this change as not just about a brand, but about increasing the power and influence of our community and growing those who can be included in our mission along the way." One of the country's biggest Latino advocacy groups has a new name. This month, the National Council of La Raza became UnidosUS. 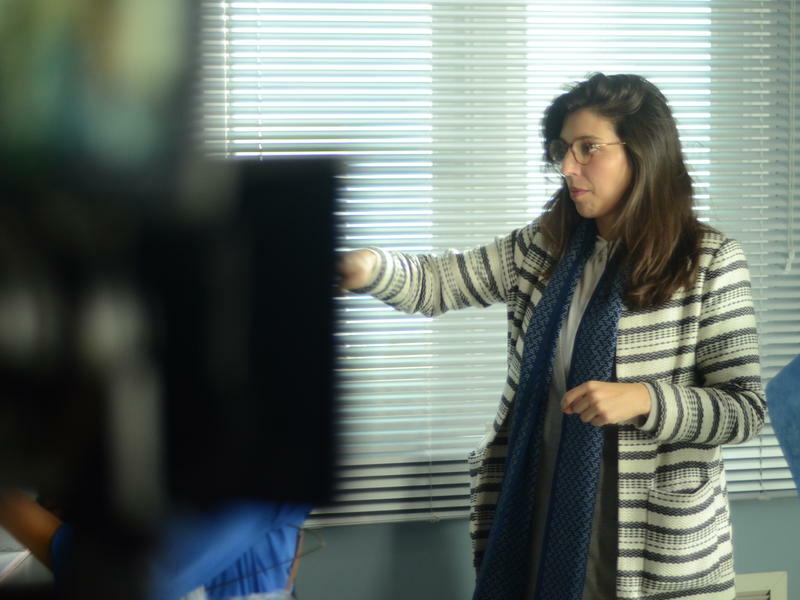 As NPR's Jessica Diaz-Hurtado reports, the group hopes to appeal to a new generation. JESSICA DIAZ-HURTADO, BYLINE: National Council of La Raza began almost 50 years ago. It grew out of the Chicano civil rights movement as Mexican-Americans sought equality. La raza is literally the race, but the meaning behind it is the people, and it became a symbol of pride and perseverance. MARICELA MONROY: La raza for me when I was growing up - it was always, like, you know, the people that are up at 5 a.m., you know, trying to get jobs, the people cleaning the stores, the people picking the food, you know, the working-class folks. Like, that is who la raza was. DIAZ-HURTADO: That's 26-year-old Maricela Monroy - born in Mexico, raised in Milwaukee. She said she was shocked when she heard of the name change, especially since it's happening under the Trump administration. MONROY: Because right now a lot of the Latino community, a lot of the immigrant community - I mean, like, we clearly feel under attack. And so in circumstances like that, we would expect leadership to take a firm stance and to go on the offensive. And this - like, this seemed like the exact opposite of that. JANET MURGUIA: We're not the same Latino community that existed in 1968 when we began. DIAZ-HURTADO: Janet Murguia is president and CEO of UnidosUS. She says Latinos today are younger and more diverse. The organization did research and found that the name National Council of La Raza is outdated. MURGUIA: We learned that our name appeared to be a barrier to our own community in understanding our mission and what we do and who we are. DIAZ-HURTADO: That's the case with 23-year-old Luz Martinez. She's an Afro-Puerto Rican woman raised in Mississippi. LUZ MARTINEZ: The term la raza is something that not everyone has been able to relate to, particularly people of Caribbean descent like me or Afro-Latinos. It's not a term that we use. DIAZ-HURTADO: Attorney and NBC contributor Raul Reyes says the term la raza has also been a flashpoint and a distraction. RAUL REYES: What's happened over the years is many critics of the organization have taken the literal meaning of the word and tried to twist it into some type of moniker of racial superiority or saying that Mexicans wanted to somehow take back the Western United States and made all these crazy arguments. DIAZ-HURTADO: The new name, UnidosUS, is meant to symbolize inclusiveness and unity. The group hopes to have a broader appeal as it advocates on issues like education, immigration and the economy. But Luz Martinez wonders if a name change will be enough. MARTINEZ: As far as my friends that are also millennials, I'm not sure that they would recognize the name before, and I'm not sure if they'll be reached with the new name. 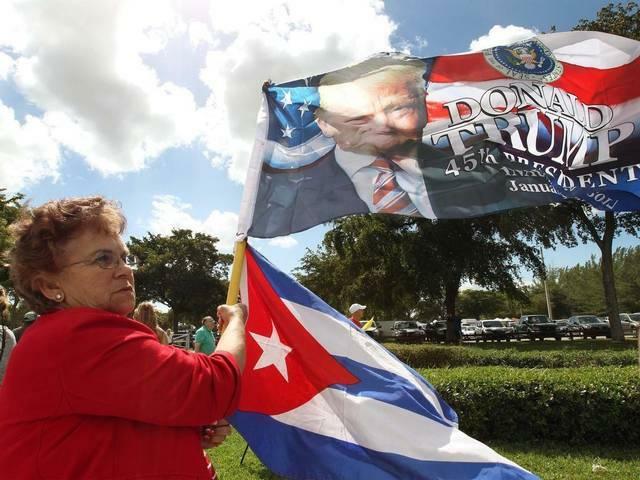 DIAZ-HURTADO: UnidosUS seems to recognize that challenge. As part of its rebranding, it plans to do more with social media to reach those young people. Jessica Diaz-Hurtado, NPR News. Transcript provided by NPR, Copyright NPR.